Blue sweater, Blue jeans, Blue scrubs, Blue socks, Blue shoes – what do these all have in common? BLUE! Wear your blue colored clothing proudly on Friday, March 2, 2012 in support of national Dress in Blue Day which kicks off a month long celebration of colorectal cancer (CRC) awareness. 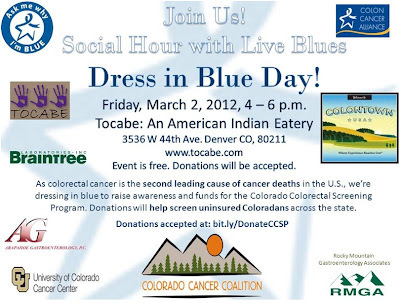 Wear your blue clothing, listen to some blues music, and raise awareness about CRC on the 2nd from 4:00 to 6:00PM, all for FREE, at Tocabe near the Highlands neighborhood in Denver. BLUE is the color of CRC awareness, and it can often be seen displayed in a star, much like the pink ribbon is used for breast cancer awareness. If you forget to wear Blue on March 2, there are 29 more days in March to wear your favorite BLUES! Colorectal cancer is the nation’s second-leading cause of cancer death, but it can be prevented through screening. If you or someone you know is 50 or older, talk to your doctor about getting screened, especially if there is a family history of the disease. For more information about CRC, including screening tests, symptoms, and treatment, please visit the American Cancer Society.